The best thing about Neil Jordan's whimsical Breakfast on Pluto is that it refuses to be a victim. For a story that could have been all about victimization - we follow the exploits of a poor, orphaned, transgender Irish kid during the worst of the 1970s Troubles - it steers entirely clear of self-pity. Because our hero/heroine, Patrick "Kitten" Braden (Cillian Murphy), is relentlessly upbeat. She doesn't seem to believe in holding grudges or letting the ignorance and oppression of her surroundings hold her down. As Kitten often exclaims in the face of terrifying circumstances, "Oh, all of a sudden, everybody's getting serious! Serious, serious, serious!" 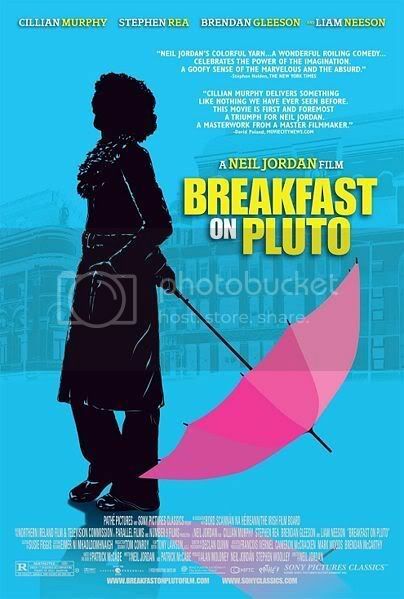 The next best thing about Breakfast on Pluto is how funny it is. Once again, this isn't the barbed humor of the gallows. Rather, it's heart-warming, humanistic and humane. On the DVD extras, Irish actor Stephen Rea describes the mood as particularly "Irish" - that is, there's an air of irreverent, bizarre, quasi-postmodern quasi-magic(al) realism. Robins that speak in subtitles. Roses that rise out of tea cups. Chapter titles ("My tights! They're in ribbons!"). It can, depending on how traditional you like your narrative, be pretty alienating. But for the PPCC - lover of postmodern magic(al) realism and wackiness - our disbelief remained suspended and we gobbled it all up. The story follows a loose, biographical structure around the various adventures of Patrick "Kitten" Braden (Cillian Murphy), who is abandoned on the doorstep of the local priest (Liam Neeson) in a nameless Irish village one day. As Kitten grows up, it becomes clear that "he" really identifies much more with "she" - and she revels in fashion shows and hilariously provocative jokes, much to the chagrin of the conservative adults around her. All Kitten knows about her parents are that (1) her father was the priest himself and (2) her mother was a beautiful Mitzi Gaynor lookalike who had long ago abandoned Ireland in favor of the "city that never sleeps", London. The wide-eyed, loving, desperately affectionate Kitten quickly flees her stifling village for London - along the way falling in love with a revolutionary glam rocker (Gavin Friday), befriending a belligerent womble (Brendan Gleeson) and some mystic Druid-inspired bikers, becoming the beloved of Bertie the magician (Stephen Rea, in a bizarre RP accent), saving her friend Charlie (Ruth Negga) but losing her friend Irwin (Laurence Kinlan), and all the while pursuing her mother, the "Phantom Lady". The film shares several similarities with director Neil Jordan's other work. In particular, its themes of fluid sexuality and the Irish Troubles are very resonant of his most famous film, The Crying Game. Meanwhile, its surreal aesthetic is very much like The Butcher Boy, except this time, the mood is light and forgiving (rather than gruesome and grotesquely scathing). Our thoughts: we liked this a lot. The aesthetic was right up our alley (and OMG, Kitten's fashion was FAAAABulous), the story was touching and engaging, and the performances were good. Cillian Murphy was very impressive as the optimistic yet occasionally vulnerable Kitten, and we just loved the young actor playing the preteen version, Conor McEvoy. Ruth Negga was charismatic and gorgeous as Kitten's longtime friend and Liam Neeson played his role with a touching air of weary tragedy (which juxtaposed nicely against his upbeat, cartoon-like behavior in one wacky fantasy sequence!). Brendan Gleeson and Stephen Rea are two of our favorite Irish actors, but we were disappointed in Stephen Rea - at least, what was with the exaggerated London accent? But that's our only tiny arbitrary criticism, and we can't really complain. This was great. WOW! I've never even heard of this and it sounds fantastic. Note to self: countries other than India also make films. Breakfast on Pluto left me with a massive girlcrush on Ruth Negga. Interesting...looking forward to see this one. Sounds like my kind of film. And also similar to 'Breakfast at Tiffany's' in some way? Your description of Kitten sounds so much like Audrey Hepburn's character in that film. This sounds interesting, I liked Butcher Boy (Crying Game not as much). I liked The Crying Game but then I got sucked in the whirlpool of Bollywood...this sounds lovely though.